The honor court is the organization tasked with enforcing Cumberland School of Law’s honor code. 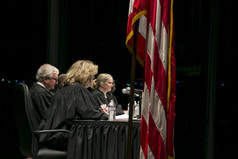 The honor court is the organization tasked with enforcing Cumberland School of Law’s honor code. The honor court is made up of 16 elected justices: a chief justice (third-year student), a deputy chief justice (third-year student), four other third-year student justices, six second-year justices, and four first-year justices. The honor court meets on an as-needed basis when it receives reports of alleged violations of the honor code. In that same vein, the honor court is available to answer any questions students may have concerning the honor code or honor court procedure. Honor court proceedings begin with a report, which can be filed by students, faculty, staff, administrators or student organizations. Upon receiving a report, the chief justice is responsible for determining whether it is appropriate to move forward with an investigation. If further investigation is necessary, the chief justice calls an informal inquiry panel made up of three justices. The informal inquiry is similar to a preliminary hearing. The justices interview all relevant parties to determine whether formal charges are appropriate or if the case should be dismissed. Should there be formal charges, then the chief justice calls for a formal hearing, which requires a panel of five justices. The formal hearing is essentially a trial in which the accused may be represented by council and confront those who filed the initial report. Should a student be found guilty, the chief justice levies sanctions that can be altered or rescinded by the dean. The decision of the formal hearing panel can be appealed. All honor court proceedings are confidential.